"Handmade Tents" is one of the renowned names of the market engaged in manufacturing, supplying, wholesaling and exporting a superior quality range of Different Types of Tents since 2012. 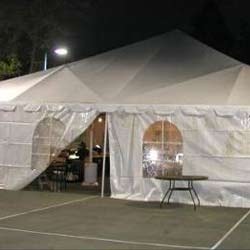 In our range, we offer Garden Tents, Luxury Tents, Mughal Tents, Wedding Tents and Camping Tents. Moreover, we offer Indian Bagicha Tents, Unique Tent, Mughal Wedding Tent, Maharaja Tent, Large Marquee Tent, Bespoke Marquee Tent and others to the clients. The range offered by us is manufactured using high quality Canvas, Fabrics, Threads and other material procured from some of the trusted vendors of the market. We offer tents that comply with the international quality standards. The entire range of tents is made available to the customers in different sizes, designs, styles, colors and other specifications to meet their needs. In order to meet the exact needs of our clients in the best possible manner, we can customize these tents as per the exact details provided by them. Our range of tents is widely appreciated by the clients for its weather & water resistance, high tear strength and easy installation & dismantling. We also check these tents on certain quality parameters to ensure that our customers get flawless products from our end. We are exporting our product over the Worldwide.